That’s why, if you’re running for public office, it’s a smart idea to say that you’re in support of local decisions. Imagine the alternative: “I’m from the distant government and I’m here to tell you how to live your life.” You probably wouldn’t win many votes. But that alternative is precisely what our lone U.S. Congressman, Greg Gianforte, did last month, when he announced that he’s introducing legislation to remove protections from a whole class of public land in Montana without holding a single local meeting in the affected areas. Specifically, Gianforte is proposing to “release” nearly 700,000 acres of federal land in Montana designated as wilderness study areas (WSAs) to the agencies, the U.S. Forest Service and the BLM, that already manage the various properties. Gianforte’s legislation is similar to that introduced by Montana’s junior Senator, Steve Daines, but Gianforte’s goes further, by including WSAs managed by the BLM as candidates to lose protection. WSA typically don’t have the soaring peaks or big trees or clear trout water of designated wilderness areas, but they do have important benefits, such as wildlife security habitat, intact native range, and accessible contiguous public land. Most traditional uses, including grazing, hunting, hiking, camping, and fishing, are allowed on WSAs. These WSAs have existed in a sort of administrative limbo for 40 years – not remarkable or remote or sacred enough to be elevated to full-fledged wilderness, but still cherished for their primitive nature. The “study” in their title is part of their problem, and Gianforte isn’t wrong to address it. They haven’t been studied for years. Instead, they exist as a sort of thumb in the eye of folks who would like to open the land for the full range of multiple uses. And the “study” designation isn’t satisfying for conservationists who would like to see the wilderness protection made permanent. If you’ve ever hunted or hiked in Bitter Creek, you might have experienced some of the primitive nature that made it a wilderness candidate a generation ago. It hasn’t changed much since then, which is sort of the point of wilderness areas. Bitter Creek contains some of the best mule deer habitat in the county, and it’s a favorite place for birdwatchers who appreciate the differences between chestnut-collared longspurs and McGowan’s longspurs, and who deeply care about the declining populations of our native grassland birds. Its designation makes it one of the few BLM properties that we know won’t change over the next generation, which is a comfort as change increasingly defines land management in Valley County. Bitter Creek’s charms are subtle, like the gumbo hillside encrusted with fossilized clam shells that I found one day as I trailed a wide-racked mule deer buck miles inside the WSA boundary. I never got close enough to that buck to make a shot, but the hillside of shells, a relic of the Precambrian sea that once covered what is now northeastern Montana, remains one of my great finds in our area. The glaciers that ground down much of the plains north of the Milk River missed this particular knob. Finding those plate-sized shells was like looking through a window back 100 million years. As a wilderness area, Bitter Creek is complicated and compromised. It is bisected by a half-dozen roads. Enforcement of off-road travel can be lax. And its designation makes it a target for derision. Recall the wind farm proposed for the ridge adjacent to the Bitter Creek WSA? The industrial energy project that was aimed at eroding local support for the WSA? The heavily-subsidized project that was finally scrapped when it was revealed that the development was really a front for a tax scam propagated by a wealthy Texas speculator? But enough about Bitter Creek. I cherish it for its wildness and the chance it offers to discover unknown chunks of country. Many folks look at its designation as needless. Even the BLM concluded that it doesn’t really exhibit enough wilderness qualities to support a wilderness area. Should we lift the WSA designation from Bitter Creek? Maybe so. Let’s have a discussion about it. But that discussion is precisely what Gianforte’s bill denies us. There have been zero opportunities for local input into the decision. I see that the Valley County Commission has gone on record in support of removing the WSA designation, but when did the commission solicit their constituents’ views on the topic? As a public-land user and advocate, I never heard about a discussion, and neither did the two dozen other sportsmen I know who hunt Bitter Creek. Local knowledge and wisdom is an undervalued commodity. Input from the folks who have to live with the decisions made by our politicians should be solicited at every turn, not only to broaden local support for laws, but to make them better and more livable. If Gianforte continues to say that he values local input, then he needs to seek it out. If he doesn’t, then he can accurately be described as another out-of-touch representative of the distant government telling us how to live our lives. 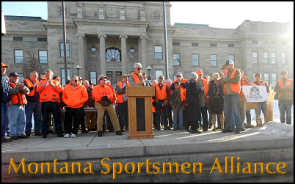 Note: Montana Sportsmen Alliance PAC The Montana Sportsmen Alliance has not taken a stand on individual WSA's. We do not support either Gianforte or Daines' bills eliminating them. We support local Montana voices in having the debate on each as to their individual values! These bills deny a voice to Montanan's. They are no different than making it all wilderness without local input. Both Gianforte and Daines owe it to this state to allow all voices to participate in a public process where these decisions are vetted and made. If that takes a lot more time, so be it!